I recently returned from two weeks in Israel. At first, with Birthright, I was shepherded around the country, given an admittedly one-sided perspective of Israel’s history and legitimacy. But despite their best efforts to enlist me in a new generation of unquestioning Zionism, I was hungry for more perspectives. In this pursuit, I listened with all my senses, not the least of which was taste. Unlike Birthright, the food of Israel tells a more holistic story. One of pride, fear, legacy and perseverance from all sides—not just the Jewish one. It paints a picture of immigration and exile, from this place and to this place as well as to this place and from it. After Birthright ended, I next spent a reflective and exploratory few days alone in Tel Aviv, where I had the space to make meaning of my experience with Israel’s most secular city as my backdrop. To help me along that journey, I did what I do best. I ate. To eat in Israel is to experience its history, intensity and magic first hand. The recency of Israel’s inception as a nation, the ebb and flow of its borders, the diaspora itself, and a culture of innovation and perseverance are all major players in making the food there so fascinating. Firstly, this is a new and changing cuisine. As Israel is relatively new, so is its food. As its inhabitants can hail from near and far, flavors and influences are global in nature. Israeli food is different from what we think of as “Jewish food’—the brisket, kugels and latkes we were raised on—even though it certainly does take inspiration from Eastern Europe (thanks to the pre and post Holocaust Jews who made Aaliyah— the religious move back to Israel). Nor is Israeli food exclusively the falafel, hummus and shawarma you normally associate with the Middle East—like the unending disagreement about rightful borders, many of Israel’s neighbors claim these recipes as their own, brought to Israel by immigrants but certainly not belonging to it. And as will become abundantly clear if you visit Tel Aviv, which has the most startups outside of Silicon Valley, Israel is a place of innovation. Young chefs like Eyal Shani and Michael Solomonov are constantly reinventing and rapidly popularizing the cuisine, winning hearts and stomachs across the globe. Today, pomegranate, date, and orange trees proliferate throughout the country, growing roots into a once swampy, barren desert land transformed by the first Zionist settlers in the early 1900s. The improbability of this evolution adds a sense of wonder to Israel’s food. Israeli cuisine is as mysterious as it is addictive - a literal melting pot of societies, opinions and ingredients that by all accounts should not exist where it does. And yet, it does. Biting into a succulent Sabich sandwich, a hearty Boureksa, or a messy Shawarma, you taste a hopeful future for Israel. One in which people exist the way their food does - where cultures, stories and history communicate progressively and can challenge one another for better, not for worse. Below are some of my favorite foods I encountered in Israel. Scroll to the bottom and you’ll find a map of Tel Aviv, which I have filled with dropped pins of my favorite places (not only for food), which are accompanied by a few words on what makes them so special to me. I hope that if you ever have the chance to visit, you’ll consider what’s below a bucket list on your own journey in understanding the Israeli experience. Sabich - A fluffy pita stuffed with slices of juicy, fried eggplant and hard boiled eggs. At Sabich in Tel Aviv (see map), the eponymous pita is artfully composed with layers of Israeli salads, whipped feta, eggplant and egg. While it may sound like a bizarre combo, there’s truthfully nothing more satisfying. Kebab - Ground, spiced meat (usually lamb) is grilled over hot coals and stuffed into a pita otherwise slathered with hummus et al. It’s a juicy, delightful mess. Shawarma - Slabs of meat (usually chicken) are layered atop a giant, rotating skewer which rotates seductively around a blazing hot fire. The meat glistens in the light as beads of moisture drip down, often onto lucky potatoes below. Ordered in a pita (smaller) or laffa (larger), the meat is shaved off and into its fluffy glutinous repository where it is met with hummus, cabbage salad, spicy condiments, and if you’re fortunate - those potatoes. Bourekas - A triangular puff pastry filled with cheese and topped with sesame seeds. The perfect morning pastry or afternoon snack. Khachapuri – A Georgian bread boat that’s baked and filled with soft cheese. 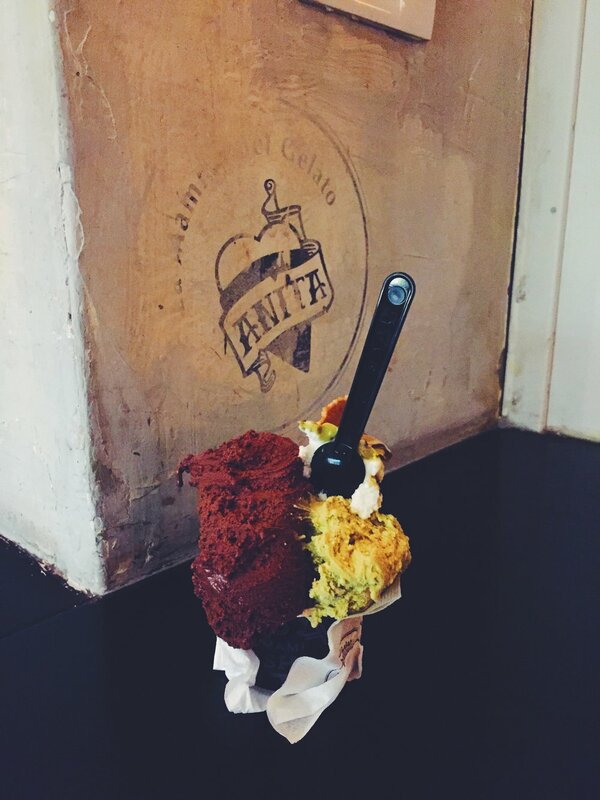 It’s indulgent in the most dairy-forward way I know. Rugelach – A tasty cookie that looks like a tiny croissant. Dough is rolled up with chocolate (or sometimes other flavorings) and baked. The rugelach from Marzipan at Machne Yehuda Market has unfortunately ruined all other competitors for me! 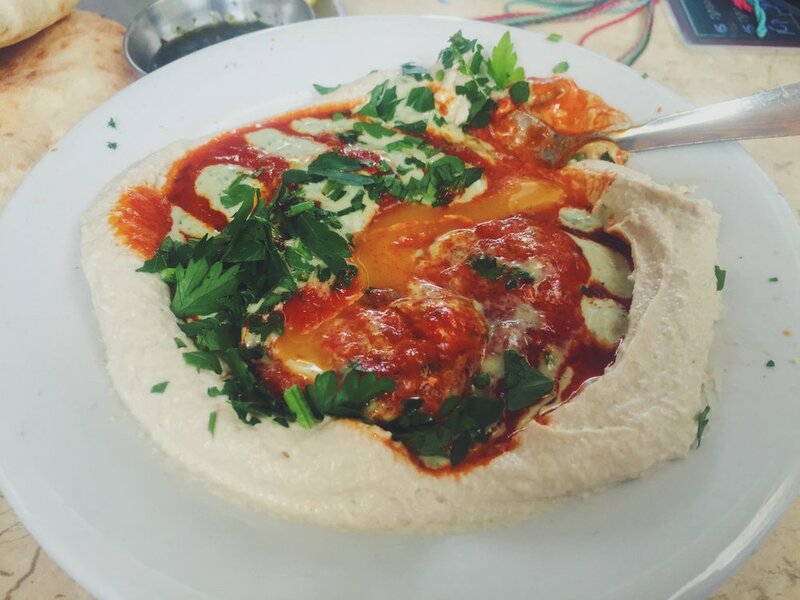 Hummus - Perhaps it’s something in the air, or the fact that everyone makes theirs fresh, but the hummus in Israel is like no other. Silky, fluffy and light - it seems to be eaten morning and night. Hummusarias (literally exactly what they sound like) are found everywhere, where friends gather to catch up the way us SF folk do over five dollar cappuccinos. Israeli Salad - A controversial name, as neighboring nations will fight to claim its origin story as their own. Chopped cucumber and tomato are dressed lightly with lemon and olive oil. It’s refreshing and simple and a favorite staple in Israeli breakfasts! Yemenite Shug/Zhug - Basically the best thing that ever happened to me. This Yemenite condiment is chimichurri living its best life. It’s cilantro, parsley, coriander, cumin and a bunch of other spices and herbs that are pulverized together to create a bright, spicy sauce that’s ideal on top of rice, eggs, bread, or just by the spoonful. I’m obsessed. Labneh w/ Za’atar - Labneh is essentially just Greek yogurt, but a little thicker and a little cheesier in flavor. At many of the kibbutzim where we stayed, it was served with breakfast, drizzled with grassy olive oil and sprinkled with za’atar (a spice blend that includes sesame seeds, sumac, oregano, etc.). Spread on some toast or eaten with savory granola, it’s pretty dreamy. Cottage Cheese - Light, fluffy and clumpy. Call me crazy, but the cottage cheese in Israel is better than anywhere else. Jachnun – This is a rolled Israeli flatbread that is traditionally served on Shabbat, when cooking is forbidden. It’s made by rolling the dough out, brushing with clarified butter, rolling it up into a long cylinder, and baking at a very low temperature Friday night through Saturday morning. The result is a Shabbat-approved, flaky, pull-apart pastry which is delicious with a little Zhug and labneh. Chatzilim – This is a cold eggplant salad which tastes like a fusion of caponata and Chinese eggplant in garlic sauce. Could the best of both worlds truly exist in one bite? Seems like it! Bamba - Imagine a peanut butter flavored cheeto puff. That’s Bamba. Irresistibly crunchy at first, they quickly transform into creamy, peanut buttery goodness in your mouth. If you have an addictive personality, snack with caution. Falafel Doritos - It’s a thing. That is all. Pop Rocks Chocolate - Look for the red chocolate bars with fireworks on them. This milk chocolate is infused with pop rocks for a truly bizarre snacking experience. Halvah - A dense, fudge-like confection made from sesame paste and sugar. It’s nutty, aromatic, a little crunchy and a little chewy. Look for it in the markets, where giant blocks are embedded with the likes of pistachios, candied fruit, Oreos...you name it. Mahalabia - A gelatinous pudding made from whole milk and sweetened with rose water. It’s strangely refreshing and like nothing I’ve tried before. Azura - Half a fried eggplant stuffed with braised, spiced ground lamb and pine nuts. It’s palpably soul warming and is the kind of bite you think about for the rest of your life. 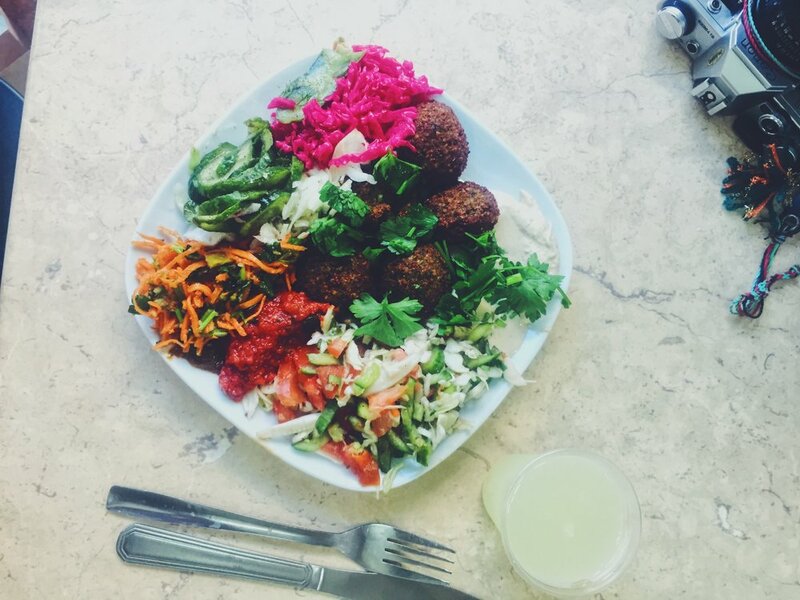 We indulged at Azura, located in Jerusalem’s bustling food market, Mahane Yehuda. Kubbe - An Iraqi-Jewish recipe, this comforting dumpling has perogies beat. The outside is made of bulgar and the inside is stuffed with spiced beef. Boiled and served in a bright pink beet broth, it’s an Instagram-worthy dish if I ever saw one. Shakshuka - Eggs baked in a cumin-spiked tomato sauce and topped with parsley. Enjoy with a fluffy pita and you’re in business! Arayes - Holy moly. These are lamb-stuffed pitas which are thrown on the grill. The juiciness of the lamb is trapped inside the pita, which becomes remarkably crispy crunchy thanks to the fat that seasons it from the inside out. I had my taste at M25 (see map), where my Arayes were smacked down on my table in a paper bag. It was arguably one of the top three bites of the trip. Turkish Coffee - Not for everyone, but the primary method in which Israelis drink their coffee. Mix the ground beans into hot water, let them settle and drink up. The coffee is rich and dark. Beware of the “mud” at the bottom! Gold Star - Cheap beer with good flavor. Hard to miss it! Pomegranate and Jaffa Orange Juice - Fruit, specifically pomegranate and oranges, propagate in Israel. The Jaffa orange put Israel on the agricultural map after Jews first began to settle there after WWI and is sweet and juicy like you wouldn't believe. Stands in markets and on roadsides will sell fresh squeezed juice by the glass, a delicacy in the US, but a cheap thrill worth daily indulgence in Israel.